Henry Fell in Drama on 21 November, 2016. ‘A great way to spend forty minutes’. 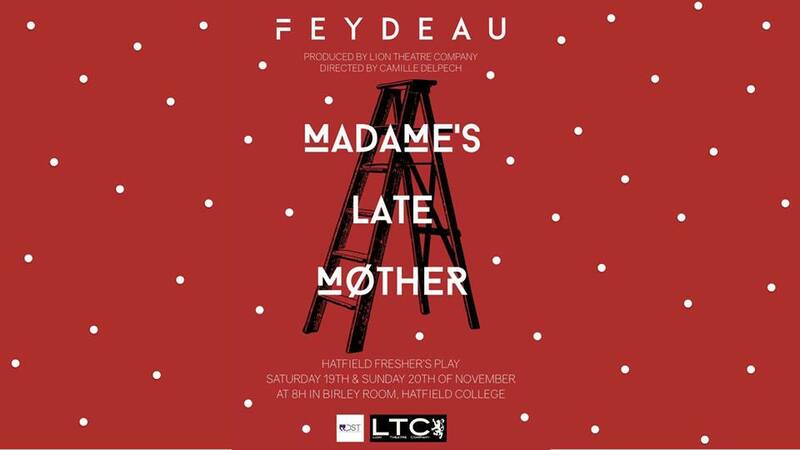 Madame’s Late Mother was LTC’s first ever fresher’s play, and was a great choice of script to ease fresher’s into theatre at Durham. The forty minute long, fast paced script held the audiences attention throughout and built to a splendid crescendo with the enjoyment of the cast clear to see. The piece was overall very enjoyable, however the inexperience of the group was at times noticeable. Madame’s Late Mother is one of Feydeau’s shorter scripts and follows the drunken return of Lucien, played by the facial contortionist Sebastian Higgins, to his startled wife Yvonne (Katie McRae). The maid (Arabella Hendreson) is soon awoken, breasts are briefly insulted and the household soon settles back to sleep, only to be awoken by a knock at the door. This signals the arrival of a Butler (Joe Norbury) who informs Yvonne of the death of her mother, the butler has however got the wrong house, and hilarity ensues. The cast was generally strong and all grew into their roles as the piece progressed, with the pace seldom wavering, which is crucial in a farce such as this. The unforgiving tempo sadly lead to some comic moments being glossed over slightly and a couple of potentially fantastic moments completely missed, with it seeming at times that some lines were not completely understood by the cast. Higgins rolled happily though his lines with his facial expressions alone leaving me in fits of laughter and showed several moments of impeccable comic timing. However I felt his use of the fourth wall was initially a little heavy handed which detracted from several snappier quips to the audience later. McRae strengthened throughout the piece and truly seemed to relish her husbands drunken idiocy as the piece progressed with a couple of mispronunciations her only noticeable errors. The remainder of the cast rounded out a slick performance with the number and pace of lines barely causing them to falter. Norbury must be complemented in the way in which he relished the truely creepy tone of several of his lines and Arabella’s final look to the audience at the end of the piece kept the humour high until the very end. The piece seemed intelligently directed throughout by Camille Delpech with a clear understanding of the medium and a keen eye for picking up on comic subtleties, a competent start in DST. The Birley Room is a potentially challenging space, and it was dealt with well, large curtains were used as an offstage area as well as providing several possible entrances. Slightly more care could have been taken in preparing the space as a Hatfield notice of some sort and a phone sat slightly to prominently on the stage. The costume and props were underwhelming with an air of ‘just what we could find’ about them, however producing is in my opinion the most alien role to anyone new to Durham Student Theatre, and so this is more than understandable. The use of a piano as a bed was a novel idea however I believe a bed could have been achieved in a more pleasing manor with slightly more thought. Despite these minor quips I believe that everyone involved should be truly proud of what they achieved. It was a piece that held my attention throughout, provided several moments of beautifully rehearsed farcical comedy and was a great way to spend forty minutes. I believe more theatre companies should consider fresher’s plays as it turns out when you leave them to get on with something by themselves they tend to impress you.